Winds are from the Southwest at 9.2 gusting to 16.1 MPH (8 gusting to 14 KT). The humidity is 43%. Last Updated on Apr 16 2019, 11:55 am CDT. "Where folks find their lifetime friends." 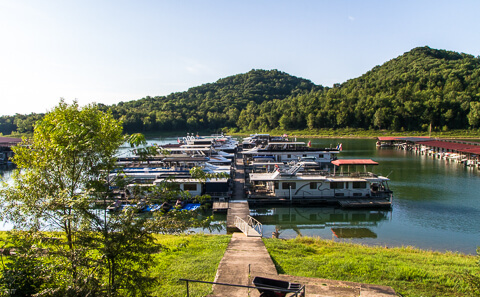 is a full service marina located on beautiful Center Hill Lake approximately 60 miles east of Nashville with access from I-40 immediately off State Highway 96. 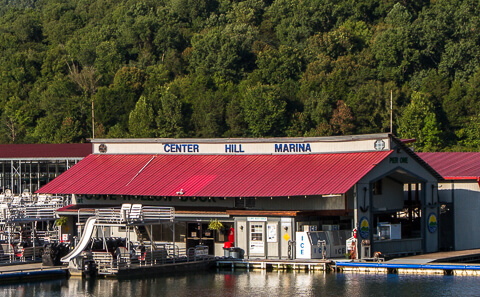 Whether you are putting in for a day on the lake or planning a dream vacation, you will find Center Hill Marina & Yacht Club the friendliest, most accessible place to be! 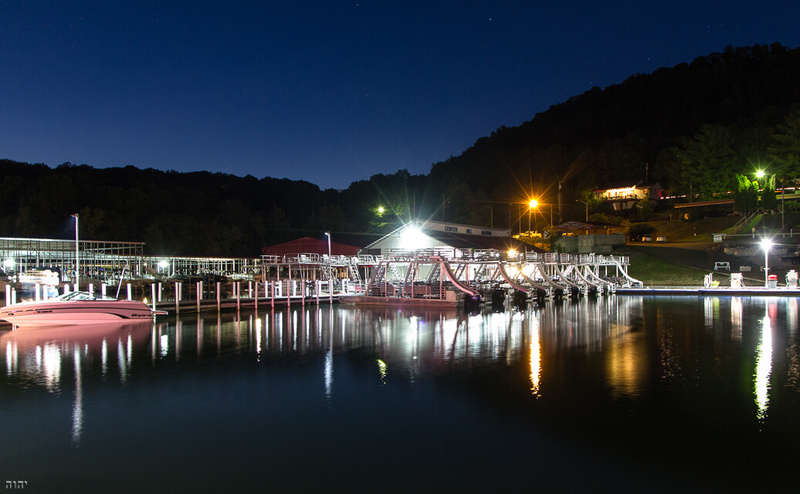 Center Hill Marina features The Coppertop Restaurant, a fully stocked Ship's Store, fuel, cabin rentals, pontoon rentals, and over 600 rental slips. Stop by for a visit or reserve your cabin or pontoon today. The Ship's Store at Center Hill Marina offers a variety of grocery items, cold drinks, beer, ice, boating supplies, marine parts, bait, tackle, resort apparel, sunglasses, souvenirs and many other essentials for your boating experience. We also offer non-ethanol fuel in 87 and 93 octane, as well as oil and propane exchanges. Please note that our stock and store hours change seasonally. 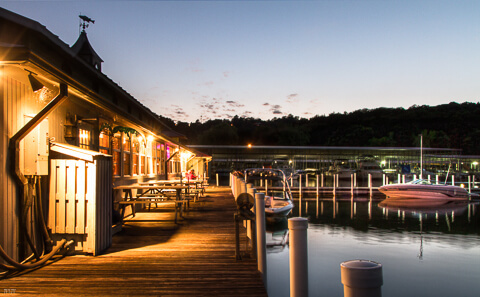 The Coppertop floating restaurant is open on a seasonal basis; primarily on weekends from mid-May — Labor Day. Our guests are offered their choice of inside seating or outside seating on our open picnic deck. 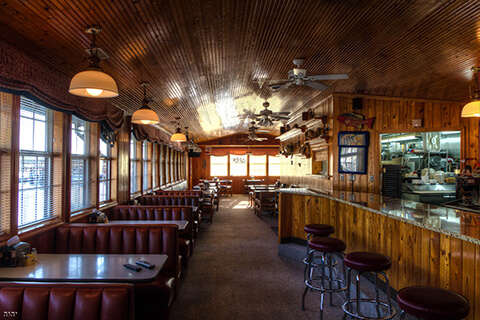 We welcome large groups, although reservations are requested for groups of 8 or more. A layer of tortilla chips topped with BBQ, white beans, mozzarella cheese, and our own BBQ sauce. Serve with sour cream and homemade salsa. A flour tortilla filled with chicken, peppers, onions, mushrooms, and a blend of cheeses. Served with sour cream and homemade salsa. A basket of eight wings either tossed in a mild wing sauce or left naked. Hand battered pickle chips deep fried to a crispy crunch. Served with ranch dressing. A basket of breaded mushrooms deep fried and served with your choice of dressing. A seasoned breaded mozzarella cheese stick deep fried to a golden brown. Served with marinara sauce. A seasoned breaded mozzarella cheese stick deep fried to a golden brown. A pizza covered in pepperoni, ham, bacon, Italian sausage, and beef. A tropical pizza with ham and pineapple chunks. A hand-tossed crust topped with marinara, cheese and pepperoni. A pizza covered in pepperoni, ham, bacon, Italian sausage, beef, mushrooms, black olives, green peppers, onion, banana peppers and jalapenos. A bed of tossed greens with tomatoes, cucumbers, eggs, ham, turkey, crumbled bacon, and croutons. Served with your choice of dressing. A medley of mixed greens topped with tomatoes, cucumbers, cheese, and croutons. A bed of tossed greens with tomatoes, cucumbers, eggs, and croutons. Served with your choice of dressing. A bed of tortilla chips topped with ground beef, lettuce, tomatoes, cheese, salsa and sour cream. All sandwiches are served with fries. Onion rings can be substituted for $1.00. A 100% beef patty that is cooked to perfection. Topped with lettuce, tomato, onions, and pickles. Our fresh, hand pulled, slow smoked pork piled generous. Topped with our homemade BBQ sauce. A generous serving of bacon, lettuce, and tomato served on Texas toast. Your choice of chicken or steak on a hoagie served hot with grilled onions and peppers. A 100% beef patty cooked to perfection on Texas toast with Swiss cheese and grilled onions. Our homemade chicken salad served on wheatberry bread. Hand breaded catfish fried to a golden brown and served on a hoagie bun. Topped with lettuce, tomato, onion, and pickles. Boneless, marinated chicken breast grilled to perfection with lettuce, tomato, onions, and pickles. Three pieces of toasted wheatberry bread with roasted turkey, Kentucky legend ham, bacon, Swiss cheese, lettuce and tomato. A ton of sauerkraut, corned beef, and thousand island dressing with Swiss cheese served on a marbled rye bread. All platters are served with a house salad and your choice of a side item. An 8 oz chopped steak topped with grilled peppers, onions, and mushrooms. Served with Texas toast. White meat chicken tenders breaded and fried to perfection. Served with your choice of dipping sauce. Also available buffalo style. Two fillet catfish golden fried or grilled. Cajun seasoning upon request. Served with homemade hushpuppies and tartar sauce. 10oz USDA Choice ribeye that is full of flavor. Served with Texas toast. A mouthwatering serving of hand pulled pork, BBQ sauce and Texas toast. Your choice of two skewers of grilled shrimp or a dozen breaded shrimp deep fried. Served with homemade hushpuppies and cocktail sauce. All kids meals are served with your choice of side and a drink. 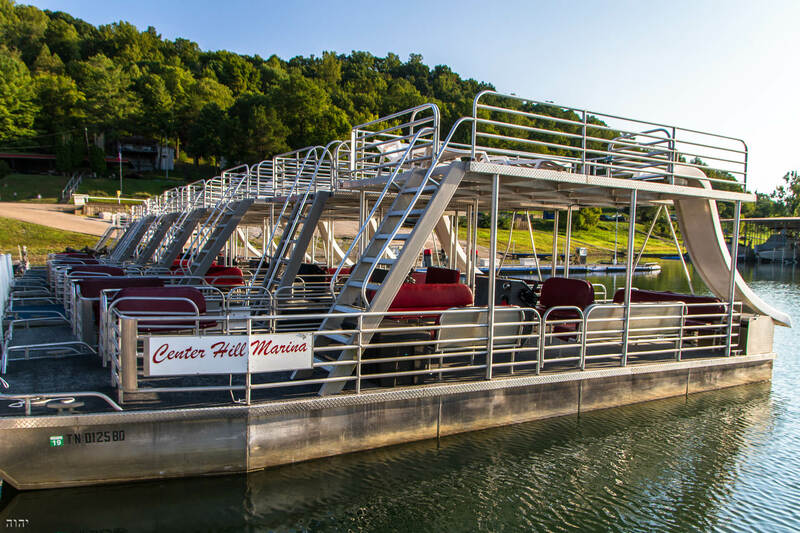 A pontoon boat rental from Center Hill Marina can provide the fun and relaxation you deserve on your next family outing or get-together with friends. Our pontoons are 10' x 30' with an upper deck. You may choose a pontoon boat with a slide or without. Perfect for swimming and relaxing in one of the many peaceful and quiet coves on Center Hill Lake. Filling out form does not guarantee a reservation. You will be contacted by one of Center Hill Marina's staff members via phone or email with the requested information. To reserve a cabin, please call our office at 615.548.4315. Pontoon reservations require a deposit of $100.00 to hold the reservation. In case of cancellation, a 30 day notice is required to receive a refund of your deposit paid. If at least 30 days notice in advance is given, we will refund 90% of your deposit. With less than 30 days notice, you will forfeit your entire deposit. You may, however, change your reservation to a later date in the same calendar year. Changes in reservations will result in a $25.00 service charge. Rental prices do not include tax and fuel cost. Must be 21 or older to rent. Maximum capacity for our pontoon boats is 14 people. For a fun-filled weekend at Center Hill Lake, start out with one of our lakeview cabin rentals. We have various sizes available to fit your needs. Each of our cabins offer a view of beautiful Center Hill Lake. Our cabins are fully furnished with all linens, towels, utensils, cookware and dishes. Our cabins are also furnished with air conditioning, TV and satellite, refrigerator and propane grill; everything you need to make your stay complete. Overnight slips are not guaranteed. Our guest slips are available on a first come, first served basis. Covered slips will be offered at a nightly rate ONLY when available and on a first come, first served basis. Cabins are available for rental beginning in April. Reservations can be made for April - October as early as January. A deposit equal to one night's stay is required in order to hold your reservation. We accept Visa, Mastercard, Discover, American Express or cash. A minimum stay of three nights is required on holiday weekends and a two-night minimum on other weekends. Peak season begins May 24, 2019 and ends on September 2, 2019. Pets are not allowed in any of our cabins. No exceptions. Why rent from Center Hill Marina? 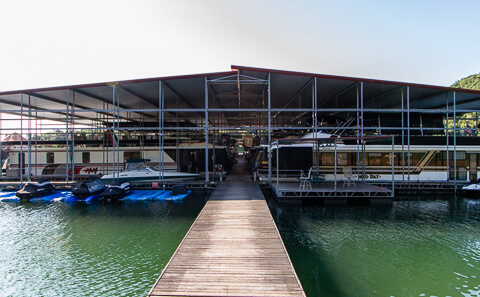 Center Hill Marina offers boat slips in a wide range of sizes, both covered and uncovered. 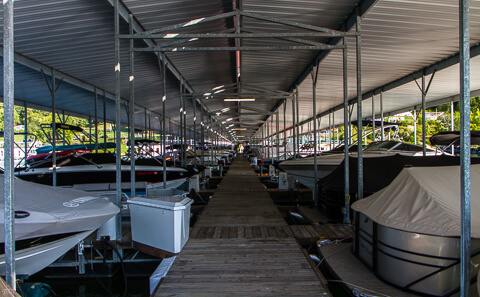 With over 600 slips in the marina, we are sure to have the perfect spot to keep your boat. Hydrohoist boat lifts are also available for sale or lease. 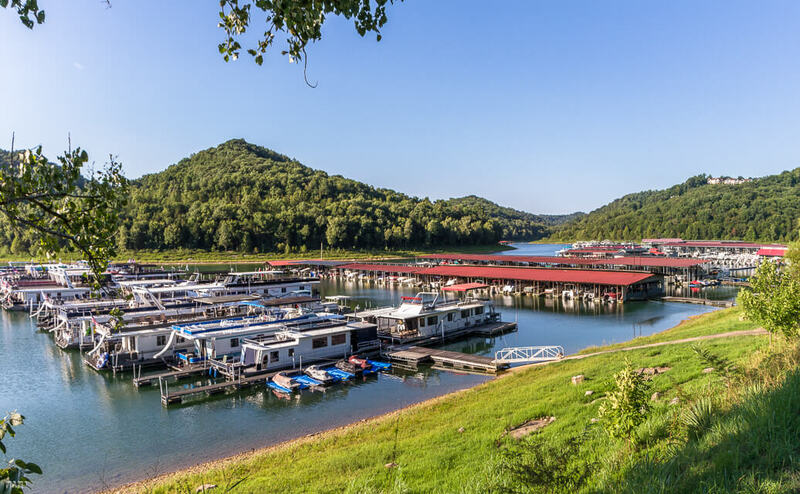 Whether you have a personal watercraft, ski boat, pontoon, cruiser, or houseboat, Center Hill Marina is the perfect place for you and your family. For additional information on rates and availability, please call our office at 615.548.4315. Our office staff is available to assist you in selecting the perfect slip to fit your needs. We look forward to seeing you on the water! Submitting this form is only a request for information. You will not be added to a waiting list or guaranteed a slip by filling out this form. Please call our office at 615.548.4315 or email us to make an appointment to view a slip. Our slips are leased on an annual contract. Slips may not be reserved on a transient basis. Slips may be rented by the day depending on availability and on a first come, first served basis. Availability is not guaranteed. Opening April 26, 2019 at 4:00 p.m. for the 2019 season.